Sight glass is used on many different types of equipment for safety and operation purposes. Fused silica: Fused silica’s cross-linked 3D structure delivers exceptional thermal shock resistance, UV transparency and near-zero thermal expansion. Industrial fused silica: This is a commercial grade of fused silica used in many sight glass applications. UV fused silica: UV-grade Fused Silica can be selected for a low content of inclusions and/or a high refractive index homogeneity if required. Soda lime: Soda-lime silica glass is the most prevalent type of glass for window panes and glass containers due to its ability to be re-softened and re-melted numerous times. It is especially popular in the food and beverage industry. Laminated soda lime: Laminated glass is created by layering two or more pieces of glass together with an interlayer. When broken the interlayer holds the glass together, providing increased strength and safety. Laminated glass is used in automobiles, architecture, and bulletproofing. Float glass: Sheets of float glass promise uniform thickness and very flat surfaces. It is commonly the pick for windows and display glass. Borosilicate: Borosilicate is the material of choice for many industries because of its affordability — especially the biomedical and research industries. Borosilicate glass remains both clear and strong when exposed to high temperatures. Corning® 1723 Aluminosilicate glass is high-temperature withstanding, very high pressure resistant glass used in equipment for steam generating electrical power. Pyrex® Code 7740: Because of its borosilicate composition, Pyrex® code 7740 glass resists attack by all acids except hydrofluoric and hot phosphoric. The low coefficient of thermal expansion allows it to withstand higher temperatures and temperature excursions than ordinary window glass. Its flat glass features a very smooth surface and low micro roughness. Vycor®: Vycor® is a high silica, high temperature glass. It provides very high thermal shock resistance. Vycor® is approximately 96% silica and 4% boron trioxide, but unlike pure fused silica it can be readily manufactured in a variety of shapes. Blue Vycor®: Made of 96% silica glass, Vycor® brand glass products are optimal for high temperature applications. Due to its low coefficient of thermal expansion, Vycor® also provides excellent shock resistance. Blue Borosilicate: Corning’s #5331 glass is a dark colbalt blue glass that is a low expansion glass for added heat resistance in furnace site glass applications. The color is specifically designed to view flame for accurate settings or readings and still protect the viewer from harmful IR and UV rays. 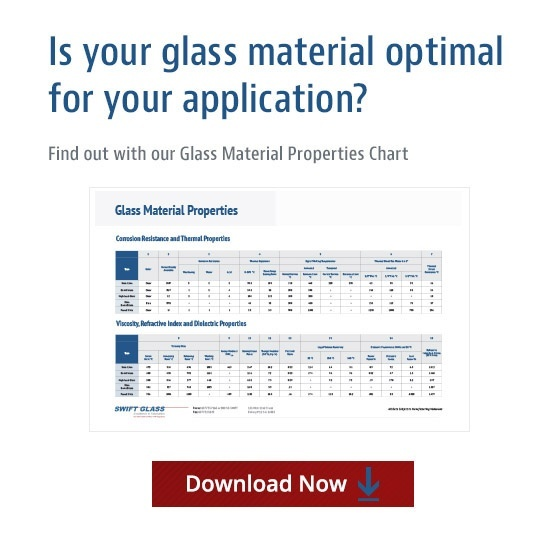 Optiwhite™ is a low-iron extra clear float glass with very high light transmission. It is practically colorless, and the green cast inherent to other glasses is not present. It is ideal for use where glass edges are visible or where a neutral colour is desired. As its light transmission is higher than clear float glass, it is perfect for applications where transparency and purity of color are desired. Optivex™ UV Blocking Dichroic filters are one of the most effective ways to block UV radiation while transmitting high quality visible light. MAXOS® safety sight and level gage glasses made of borosilicate glass are perfect for temperatures up to 300 °C. Questions about our sight glass? Contact a Swift Glass expert today. You can also download our free Sight Glass guide for more information.